Today, we’re taking a brief break from our regular Wednesday’s Word format. 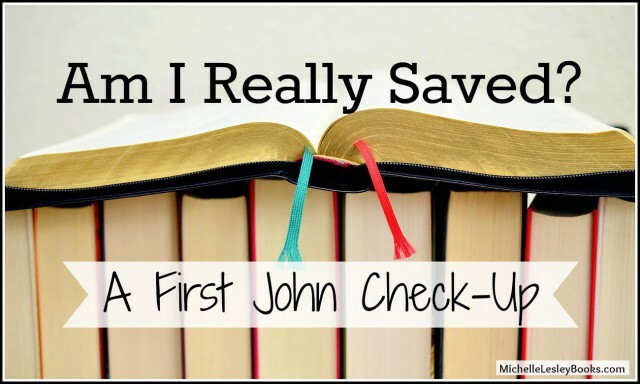 For the next (approximately) six to eight weeks, we’ll be studying the book of 1 John. If you’ve ever wondered whether or not you’re really saved, think a loved one might be a false convert (someone who thinks she’s saved but isn’t), or are wondering about that “Christian” author who keeps promoting unbiblical ideas, you’ll find that 1 John has the answers to a lot of your questions. So let’s dig in and get those questions answered. There’s just one ground rule- you must read the entire text of the chapter of 1 John we’re dealing with in each lesson. (Don’t freak out, though, the longest of the five chapters is chapter two, weighing in at a lightweight 29 verses.) This isn’t going to be a line by line study. We’re going to focus on the “Am I Really Saved?” check points in each chapter. So, you’ll need the entire chapter for context, plus, it’s a phenomenal book and I don’t want you to miss any of it. Ready? Our relationship with Christ can be a hard one to quantify. It’s not like a big red “C” for “Christian” appears on our foreheads when we repent of our sin and trust Christ for salvation. We look the same, we talk the same, we live in the same place. We can’t even trust our feelings to validate that we’ve truly been born again. So sometimes, we’re left wondering, “Am I really a Christian? How can I know for sure?” Those kinds of thoughts can produce a lot of anxiety. But God doesn’t want us to worry or live in constant fear that we don’t belong to Him. He’s very clear that He wants us to know for sure, one way or the other. How can we know? Second Corinthians 13:5 tells us that we need to examine our hearts, test ourselves, to see whether we’re in the faith. As Christians, we use God’s word as a measuring stick for our salvation, not a prayer we once prayed, an emotional or spiritual “experience” we once had, baptism, church membership, being a “good person,” or external “Christiany” behavior, activities, or knowledge. Remember, Jesus said that there will be many people who claim to be Christians and look like Christians on the outside whom He will turn away from Heaven on the day of judgment because He does not know them as His own. So, maybe the people John was writing to had some of the same questions and anxieties about their salvation that we have about ours. First John is the first and longest of three brief epistles, or letters, written by the apostle, John. You might remember John – along with his brother James – as one of the “sons of thunder,”or “the disciple whom Jesus loved.” Originally a fisherman, John became one of Jesus’ “inner circle” (with his brother James and Peter) of disciples. John was the longest living of the original twelve disciples, and is believed to be the only one of the twelve who was not martyred for his faith in Christ (though he was eventually exiled). John also wrote the gospel of John and the book of Revalation. First John is classified as a “general epistle” and was probably written circa 90-95 A.D., toward the end of John’s life, to the churches he shepherded in Asia Minor. It is likely that these churches were encountering the heresy of gnosticism, which may have been why they needed a little refresher course in salvation, and which John seems to combat in this epistle. In 1 John 1:4 and 5:13, John personally explains two of his reasons for writing the epistle. 1. In 1 John 1:1-3, which words and phrases indicate that John knew Jesus and was an eyewitness to His ministry? Why would his eyewitness testimony have been important to the churches he was writing to? 3. Why was it important for John (and other New Testament writers) to actively combat false teaching rather than take a more passive approach such as simply praying for the false teachers? 4. Think back to your salvation experience. Do you believe you’re saved because you prayed a prayer, got baptized, or because you’re a good person? Reflect on Matthew 7:21-23. What impact does this passage have on you? 5. List some specific ways your relationship with Christ has, over time, changed the way you think, speak, act, regard others, and regard the Bible. Do you see evidence of your growth in Christlikeness? 6. If you prayerfully examine your heart (2 Corinthians 13:5) during this study and suspect that you might not truly be born again, what will you do? What Scriptures can you turn to for help? You are more than welcome to use the 1 John study or any of the other studies or lessons in their entirety as long as it’s made clear in some way to the folks in the class that I wrote it. (Please understand, that’s not an ego thing or a credit thing for me. That’s how I take responsibility for what I’ve written and stay accountable.) It is absolutely fine with me if you want to print out the lessons for the whole class or whatever, as long as they’re made available for free. Or if you just want to use it as prep material while you study, that’s fine too. thank you. Plan on doing this study myself this summer and lead a group using this study in the fall. It is heavy on my heart. The church is my mission field. Seriously – let me know when you want to come to the Oregon coast. We will have great praise time at the beach!